In the Query box, type Facebook. You want to get the Facebook application, so you can tap the line with the Facebook icon. If you tap the line with the Facebook name, it brings up all the titles of apps, games, books, and magazines that include the Facebook name. 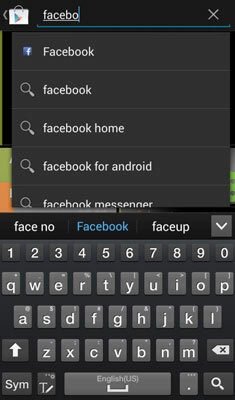 As you can see in the search results, there are several options that include the word Facebook. 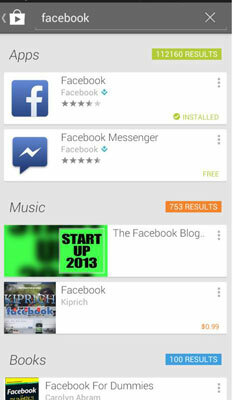 The other lines in the apps section are for apps that include the word Facebook. These are typically for apps that “enhance” Facebook in their own ways. Currently, there are approximately 112,000 of these. Rather than going through these one by one, stick with the one with the Facebook icon. Tap the Facebook app and you will get a lot of information. Before you continue to the next step, check out some important elements on this page. Title Line: The top section has the formal name of the application with an Install button. After you click this to download and install the app, you’ll see some other options. Screen Captures: These are representative screens. They are a little too small to read, but they do add some nice color to the page. Feedback Statistics: This particular app has about 3.5 stars out of five. That’s not bad, but not great. The other numbers tell you how many folks have voted, how many have downloaded this app, the date it was released, and the size of the app in MB. Rate and Review: This is blank until you have downloaded the app that you would be voting on. What‘s New: This information is important if you have a previous version of this app. Skip this section for now. Reviews: This section gets into more details about what people thought beyond the star ranking. More by Facebook: The app developer in this case is Facebook. If you like the style of a particular developer, this section tells you what other apps they offer. 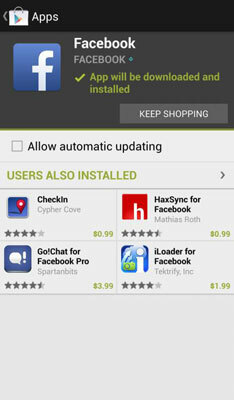 Users Also Installed: Play Store tells you the names of other apps that the customers who downloaded this app also downloaded. It is a good indicator of what else you may like. Users Also Viewed: Same idea as the previous bullet, but it’s somewhat less of an endorsement. The other users only viewed the other apps shown here. They didn’t necessarily purchase them. Developer: This section gives you contact information on the developer of this app. Google Play Content: This is how you tell the Play Store whether this app is naughty or nice. Before the download process begins, the Google Play store tells you what this application plans to do on your phone. 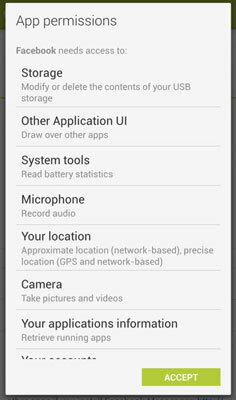 This information lists all the permissions you will be granting the application when you download it. This is similar to the license agreements that you sign. Hopefully you read them all in detail and understand all the implications. In practice, you hope that it is not a problem if lots of other people have accepted these conditions. In the case of a well-known application like Facebook, you are probably safe, but you should be careful with less popular apps. Each app asks you for permission to access information, such as your location. If you do not want the app to use that information or share it somehow, here is where you would find out if the app uses this information. You may be able to limit the amount of location information. If you are not comfortable with that, you should decline the app in its entirety. 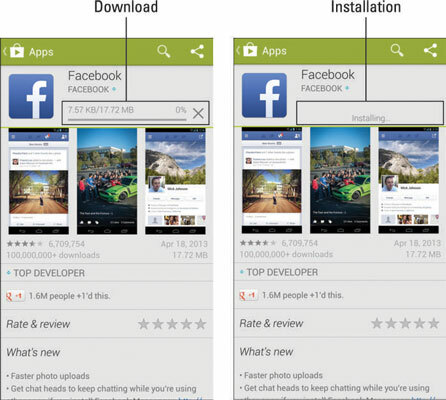 Before the download process starts, your app may want to know two things. 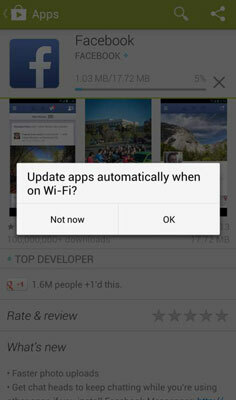 First, do you want your phone to automatically update when Facebook (or the app provider) releases a newer version? In general, this is the most convenient option. It is rare, but not unheard of that an update makes things worse. The second is whether you want to wait for the update to take place only when you have a Wi-Fi connection. This prevents your phone from downloading a huge application update over the cellular network. In most cases, using a Wi-Fi connection is a better option. Facebook asks you this question in the pop-up. This is like downloading apps to your PC over the Internet. The screens show you the progress of downloading and installing the application. This may happen so fast that you look away for a second and when you look back, it’s done. Sometimes the Play Store offers you the option to keep on shopping while the app downloads in the background. If you like, you can watch the process in the notification portion of your screen. The Facebook app will finish installing, depending on the speed of your connection. Apps immediately give you the option to either open them or uninstall. 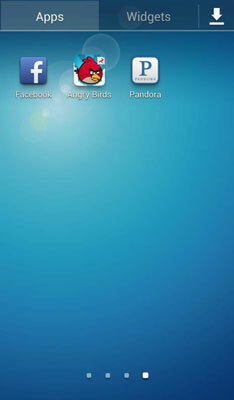 The Facebook icon is now on your Apps screen along with some other recently added applications. If you want this app to be on your Home screen, press and hold the icon.